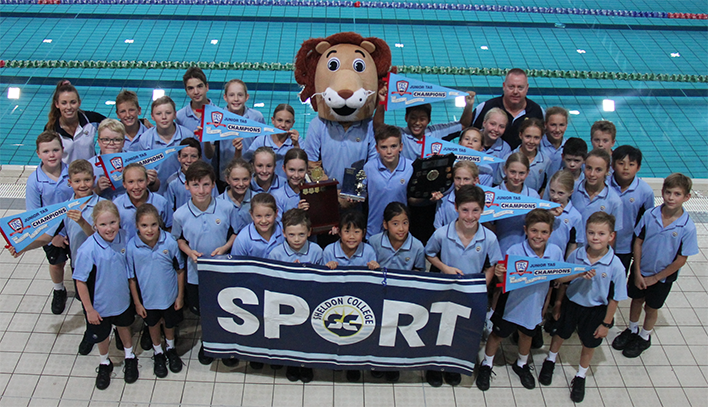 Sheldon College Swimming is on a high after a fantastic run of results at this term’s swimming carnivals, featuring Championship wins at the Bayside District, GBC and Junior TAS Championships. At the District Championships, Sheldon College was crowned the Champion Primary School and finished second in the Secondary stakes, with 27 of our students selected to represent Bayside District at the Metropolitan East Championships. In so doing, four of our students (Jamie Jack, Hayden McKillop, Darcie Young and Millie Rae) were named District Age Champions, and a further three (Sine Finnegan, Pippa Bell and Arran Lendrum) finished as Age Champion Runners-Up. Impressively, Sheldon College students also broke four District records, being Jamie Jack (17+ Year Boys 50m Freestyle and 50m Butterfly), Hayden McKillop (15 Year Boys 50m Butterfly) and Millie Rae (10 Year Girls 100m Freestyle). Not long after the District Championships, the Metropolitan East titles were contested, featuring the best swimmers from the vast number of schools located within our region. Here again, Sheldon College students excelled, with 13 of our swimmers now selected to contest the Queensland School Sport Championships: Pippa Bell, Jemma Butler, Jo Chang, Armand Hamilton, Jamie Jack, Will Jones, Arran Lendrum, Hayden McKillop, Timothy Morante, Millie Rae, Harry Towner, Darcie Young and Wilson Young. Next on the calendar was the Greater Brisbane Conference (GBC) Championship, which Sheldon College has won on every previous occasion. This year was no exception, with the College comfortably winning the Championship; placing first in both the male and female point scores; and winning nine of the twelve age group trophies on offer. At this carnival, six of our students were named Age Champions (Jamie Jack, Hayden McKillop, Anders McAlpine, Darcie Young, Kata Hamilton and Liam Manson), and a further five (Georgia Wruck, Harry Towner, Leahrose Hooper, Georgia Tennant and Coby McGill) finished as Age Champion Runners-Up. Jo Chang also smashed the 12 Year Boys 50m Breaststroke carnival record by more than a second. In addition to all of the students involved, congratulations are extended to Sheldon Academy of Sport Head Swimming Coach, Alex Jordan, for his leadership of our swimming program. The vast majority of students highlighted above train solely within Sheldon Academy of Sport Swimming squads. A special mention also to our Learn to Swim staff, as many of our younger swimmers began their swimming journey within the Sheldon Learn to Swim Centre program. We wish all students competing at the State Championships, the very best of luck.